As if toilets aren’t dirty enough, they’re equipped with loosely-fitting caps that are easily-broken, always unsightly and sometimes dangerous. 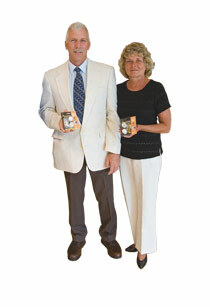 Our inventors, Gary and Ruth, feared that family pets or even toddlers may pick up the loose snap-on caps and choke on them, so they decided to flush those worries away, by designing and patenting a new cap with some staying power. With their new product idea patented, Gary and Ruth came to Davison for some help in getting their invention from the bathroom floor to the marketplace. Our creative team got to work and gave Gary and Ruth’s idea a little twist, creating a cap that is threaded on the inside and screws directly onto a toilet bolt, to securely fit to a toilet’s base. Designed with an adapter, Twister Caps fit both common sizes of toilet bolts. The Davison Team even took Gary and Ruth’s idea one step further, with Twister Bolts, which include both the bolt and matching cap. Licensed by an industry leader, Twister Caps and Twister Bolts have sold in home improvement and hardware stores nationwide. While swirling to success may have taken longer than they expected, the Frazers said they could not be more pleased with the end result of their idea. “When we contacted Davison, we were naturally skeptical as to how your company would respond to our needs and concerns regarding our invention. All of our concerns soon diminished as Davison demonstrated its professionalism to us. We experienced excellent written communication, scheduled telephone conversations that were always on time, and friendly representatives proved to us that we were working with a company that truly cares about its clients. A typical project does not get a royalty agreement, sell in stores or generate a profit.